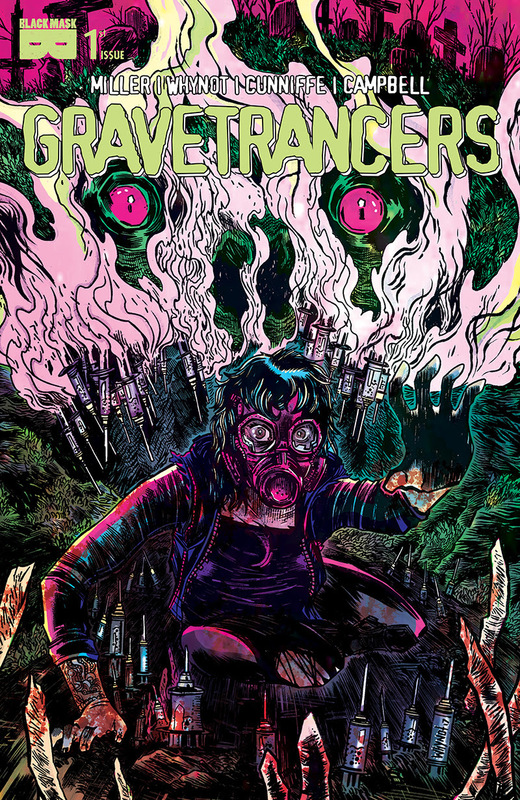 The Fellowship was fortunate enough to obtain a copy of GRAVETRANCERS #1 from Black Mask Studios. The story is written by M.L. Miller; with art by James Michael Whynot, colors by Dee Cunniffe, and lettering by Jim Campbell. We’ve all heard stories of funeral parlors or cemeteries doing questionable things. M.L. Miller has successfully taken that concept down a different path for a darker reason. This is a genuine disturbing story. The art by Whynot and Cunniffe is beautiful and grotesque at the same time, a difficult feat. The art becomes more disturbing and abstract as reality slips away from our heroes. Black Mask Studios titles tend to focus on the darker side of the human race and are not for everybody. That being said this is another great start to an intriguing ride which I am going along. Check it out. GRAVETRANCERS #1 is in stores now or available at www.blackmaskstudios.com.